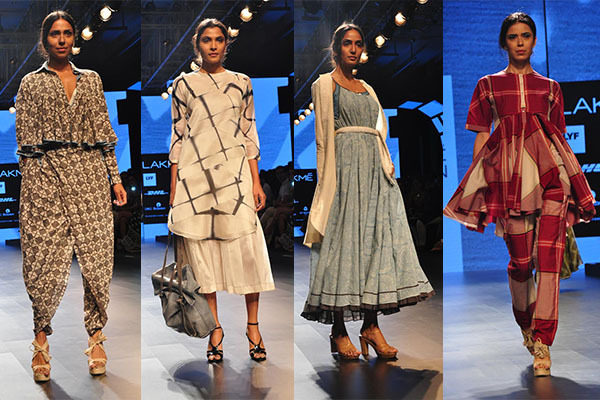 Wendell Rodricks’ walkthrough saw models decked in ghagras, saris with floor length cape blouses, bolero choga, khadi kurtas, pleated skirts, tunics and churidars. 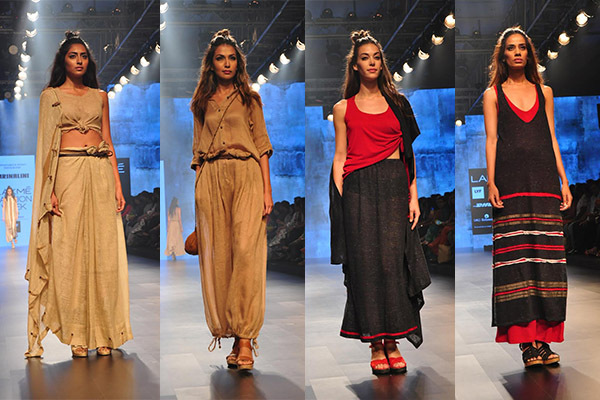 Interesting numbers like dhoti-jumpsuit-sari and farshi pyjamas were a step ahead in fusion and hybrid fashion. 11.11 demonstrated the story of dressing up with an interactive show where models dressed in soft laidback trousers and shirts, and sensuous draped garments sashayed down the runway as designers added the finishing touches to their looks. We’re swooning over the indigo hued separates! #indiacollective presented an exciting take on sustainable fashion that resonates with the new age fashionista. 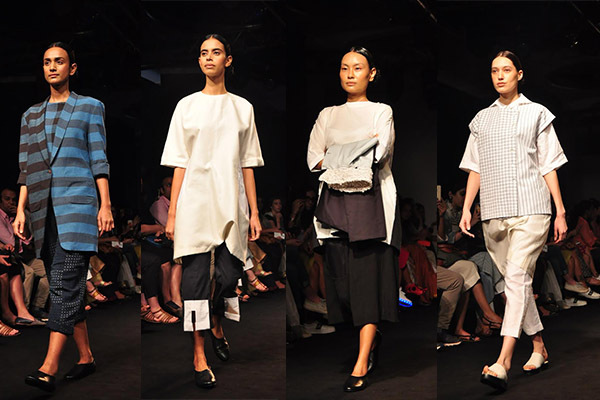 A display of dresses paired with shirts made using handwoven indigo dye at Maku while Injiri showcased clean and minimalistic separates in whites and blacks using organic cotton. The Aish Life displayed a line up of monochrome numbers created through jamdani, Pashmina and khamir cotton; Deepa Gurnani’s runway saw real women donning exquisite jewellery in brass, antique metallics and bright golds and finally NorBlack NorWhite grabbed every eye with modern, chic creations such as flared dresses, gleaming jackets and more through a mashup of techniques from Kutch, Kerala and Andhra. 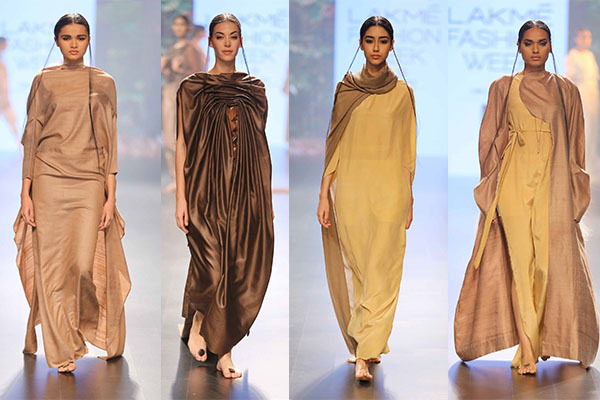 Gaurang gave his signature style a Spanish twist with saris paired with puffed up and ruffle-sleeved blouses followed by a series of dramatic floor-grazing gowns in nudes and delicate morning hues. The sharp pleats and dramatic ruffles were a refreshing break from his previous collections. The handwoven story at Paromita Banerjee’s collection included bengal handweaves like Dhakai Jamdani, Malkha Khadi and fine mul mul block prints. The global wardrobe with regional influences had the six yard sari and the LBD. 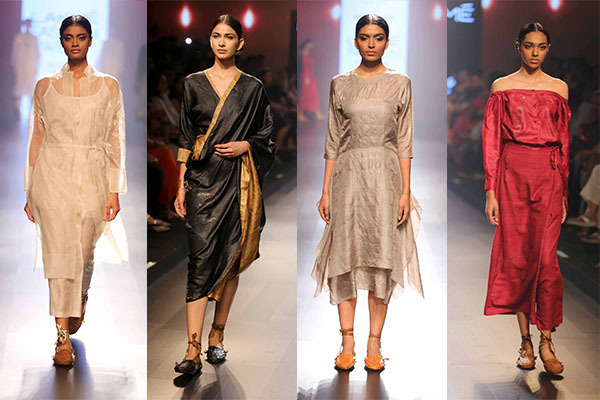 Kaftans over harems, casual drapes and belts paired with saris defined Mrinalini’s collection. The dusty hues of beiges and browns were uplifted by ensembles in red and black. 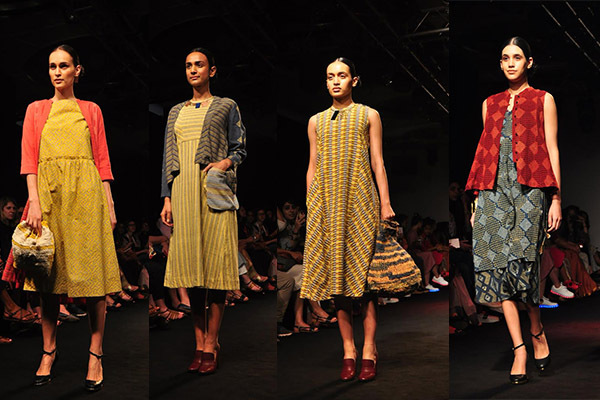 Fun, bright colours, ikat prints and tan gladiators made for an interesting collection by The Meraki Project. We loved the cool separates and the fact that they use sustainable textiles is reason enough to add this to your summer story. Influenced by Gurunsi architecture and the decorated walls of Burkina Faso, the clothes at Indigene were geometric and linear. This collection revived the crochet bag, and brought back a fluid organic look. Oversized coats, colour blocked jumpsuits and rolled up pants made for a breezy collection at ASA. Despite the over dose of stripes, we’re still favouring the light, comfort wear. 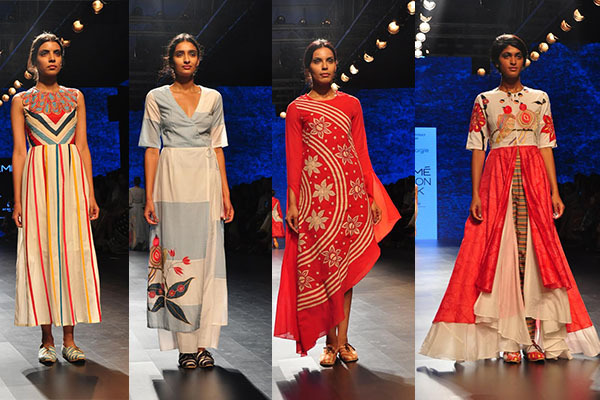 One of the cutest collections of the season, Swati Vijaivargie added poetry into design with intricate aari embroidery, fun coral stripes, patchwork and appliqué work. Perfect for a non conformist boho traveller, we loved the khadis, cottons and chanderis. Read about what inspired this collection here. 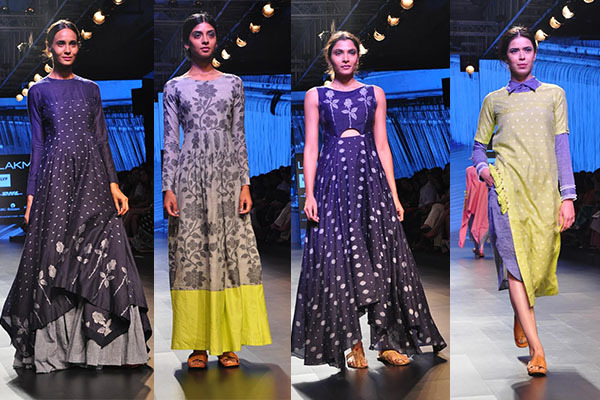 Debashri Samanta’s collection revolved around the signature element of summer – floral prints, but in indigo. Hints of neon added a dash of playfulness to the collection. We particularly loved the used of pompoms over the intense blue. 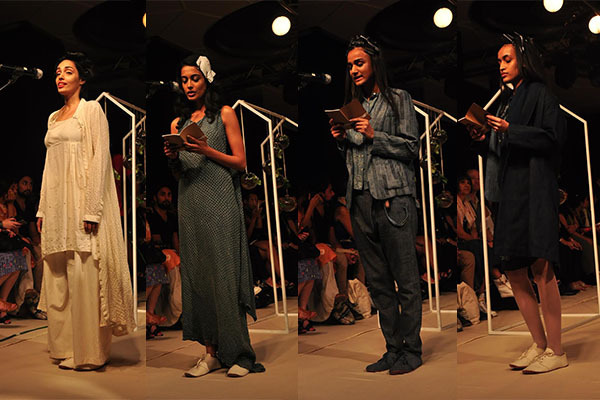 Creating a collection that embodied several hand processes like ikat, shibori and block printing, Amrich Designs was all about contemporary wear. Leftover up-cycled material found its way into the collection. We especially loved the over sized tote in shades of beige and blue. 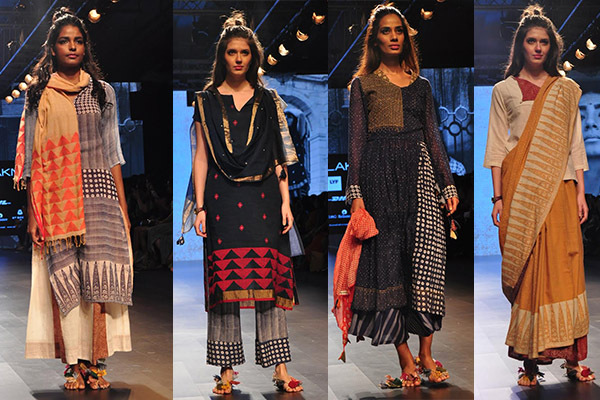 Muslins woven with handspun cotton, gossamer like jamdanis were spotted at Swati & Sunaina’s collection. For evening wear pure zari saris were complemented by Mughal motifs. Corals, soothing blues and pinks encompassed the summery colour palette. Effortless dressing defined the collection at Pella. Various shades of beige and browns took over the runway. We loved the free-flowing garments and the comfort they promise during the warm days of summer.